Campbell, famous for his play off final winner (right), is now a free agent after signing a deal to end his contract early. 'I have confidence in my own ability and that I still have a lot to offer a Football League club,' he told the Echo. Campbell was linked with Newport County and has had unsuccessful loan spells at Oxford and Doncaster. 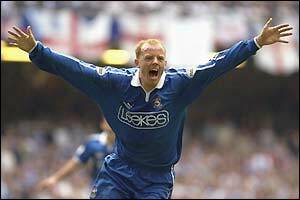 He first signed for City on loan scoring 6 league goals in 5 starts including a hat trick at Oldham. Since signing on a permanent basis nearly 4 years ago he's only scored a further 6 league goals from 25 starts and 43 appearances off the bench. Toni Koskela left Ninian Park for the last time yesterday. He was having a final clearout before flying to a new club in Greece. His contract was also paid up.